Need an extra boost to get through your day? 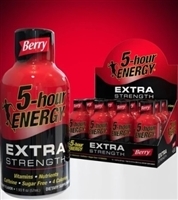 Grab a Berry Extra Strength 5-hour ENERGY® shot. It’s packed with a big energy blend and big taste. The only thing small about it is its size. 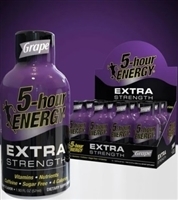 So, why sip yet another coffee when you can have a Berry Extra Strength 5-hour ENERGY® shot and get hours of energy? Berry Extra Strength 5-hour ENERGY® shots are packed with a blend of essential B-vitamins and amino acids, but no sugar or herbal stimulants.